One Sunday afternoon in October of 1869, Stubb Newell, a farmer in upstate New York, invited his neighbors over to view the remarkable discovery he made while digging a well on his Cardiff farm. When they arrived, he showed them the body of a ten-foot-tall “petrified” man, lying at the bottom of a shallow pit where Newell had instructed workmen to dig. The giant was a magnificent sight: A stone man naked in repose, seemingly at peace. It could hardly have been hyperbole when a newspaper reporter wrote: “Men left work, women caught up their babies, and children in all numbers hurried to the scene where the interest of that little community centered” (The Lafayette Wonder, 1869). This creature became known variously as the Cardiff Giant, the Onondaga Giant, and the Goliath of Cardiff. It has become an enduring icon of Americans’ enthusiasm for hoaxes that confirm faith over science. Newell recognized the commercial potential of his fascinating discovery. By the next day he had obtained and erected a circus tent over the remains of the giant, hired a carnival barker to serve as his docent, and began charging people 25 cents for a peek at the remains. Virtually overnight he transformed his farm into a multi-tiered tourist operation. Newell’s wife sold sandwiches and cider, and if you needed a ride from the train station to the farm, he could supply that as well. For a fee. People came in droves, producing a far more substantial income for Newell than farming ever could. And Newell wasn’t the only one who benefitted from the presence of the giant. Cardiff was a tiny village, incapable of supplying the necessities of a burgeoning tourist trade. Nearby Syracuse had hotels, restaurants, and other amenities for visitors, and its businessmen recognized the economic potential of the giant in Cardiff when their receipts began to rise. When circus impresario P.T. Barnum offered Newell more than $30,000 (approximately $500,000 today) to purchase the giant outright, they were understandably concerned. A consortium of local men stepped up, paying Newell that much for only a three-quarter interest in the giant, ensuring that the specimen would remain local. Along with that gigantic inflow of cash, Newell continued to earn a quarter for every dollar made in ticket sales. But what accounted for the booming popularity of the Giant? The going story, especially popular among theologians, was that the Cardiff Giant was a fossilized representative of a group of creatures mentioned in the Bible, the Nephilim. (“There were giants in the Earth in those days…” Genesis 6:4). So the Cardiff Giant provided proof of the existence of these biblical giants, and by extension literal proof of other Biblical stories. Not everyone agreed, however. Scientists noted that the raw material from which the giant was made was gypsum, a soft rock wholly unlike that of any genuine petrification and one that would not last very long in the acidic soil of the Newell farm. Othniel C. Marsh, a well-known paleontologist at the Yale Peabody Museum, wrote a letter to the Syracuse Daily Journal on Nov. 30, 1869: “It is of very recent origin and a most decided humbug …” University of Pennsylvania geologist J.F. Boynton concurred, suggesting, based on erosion rates, that the statue could not have been ensconced in the soil of the Newell farm for much more than a year before its claimed discovery. 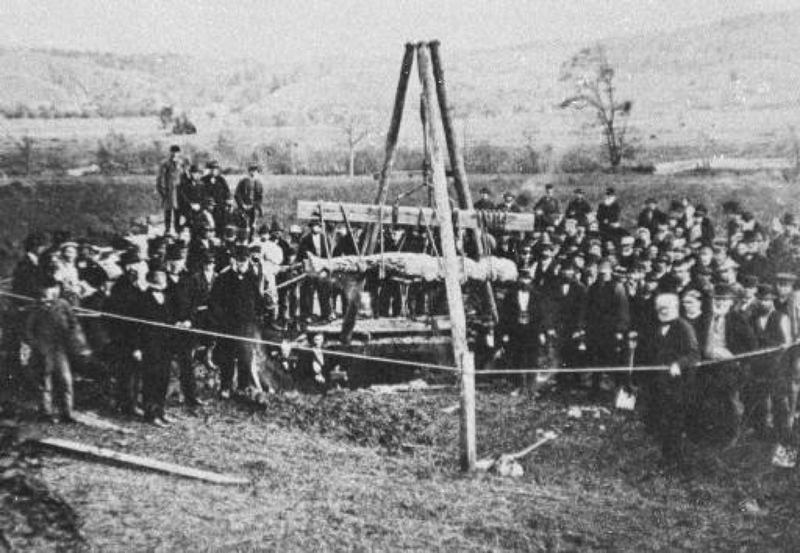 Excavation of the “Cardiff Giant” in 1869. The testimony of well-respected scientists quelled the fervor of some. However, it wasn’t until a shadowy figure emerged to confess to the hoax that belief in the Cardiff Giant evaporated. That figure was George Hull, a relative of Stub Newell. Hull was a Binghamton, New York cigar manufacturer and an inveterate atheist. While on a visit to his daughter in Iowa, Hull was talking with a minister there about biblical inerrancy when the conversation turned to the story of David and Goliath. The minister maintained that, indeed, there had been a ten-foot-tall champion of the Philistines and that the Bible said so. Hull, while dismissive of a story he considered twaddle, nevertheless wondered if there might be a buck to be made from rubes who would pay to see “evidence” for the past existence of such a giant. In a confession printed in the Ithaca Daily Journal in 1898—nearly three decades after the Cardiff Giant’s discovery—Hull said this conversation was inspiration for the hoax. He explained that he’d purchased a small tract of land in Iowa, from which he extracted a block of gypsum. He then had the stone shipped to a stonecutter in Chicago to sculpt the giant according to his specifications. Upon its completion, Hull shipped the sculpture to Cardiff and with his cousin Newell planted it in the ground late in 1868, almost exactly one year before its “discovery.” The timeline of Hull’s confession almost exactly matched the geologist Boynton’s calculation. Allowing it to steep in the soil for a year provided time for the stone to weather, bestowing it with a patina of antiquity. At the agreed upon moment, Newell hired laborers to dig the well exactly where he knew they would encounter the giant petrified man from before Noah’s flood. In truth, the Cardiff Giant wasn’t that convincing a humbug, so why were people so interested in believing in it? 1869 was a contentious time for science and religion. Darwin’s On the Origin of Species had been published just 10 years earlier, creating an ongoing discussion about theories of evolution. The study of fossils and historical geology was further challenging biblical creation stories. There was no room in the emerging scientific consensus for Adam and Eve, Noah, or, for that matter, an ancient race of giants—yet here was a discovery that defied that. And the Cardiff Giant spoke to a deeper American myth. Consider the man apparently behind its discovery: farmer Stub Newell. Not a scientist, and without a college degree, he had made a discovery that contradicted the viewpoint of scientists. There were giants in the Earth in those days and, if there had been giants, maybe Genesis was as much history book as holy scripture. 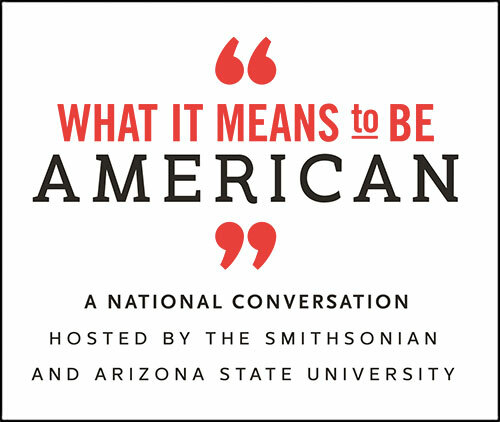 In this, Stub Newell represents the very American trope of the amateur who, despite the naysaying of the credentialed class, makes a discovery that ostensibly changes what we know about the world. 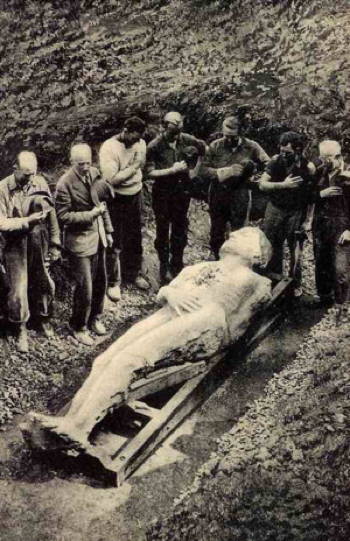 The Cardiff giant lived on even after its unmasking. After P. T. Barnum failed to purchase Newell’s giant, he had a replica made, which he exhibited as the real thing. Barnum’s version was a fake of a fake! Amused, Mark Twain was inspired to write a short story about all this. Titled “A Ghost Story,” Twain has the spirit of the Cardiff Giant haunting the hotel across the street from where its body is callously being displayed. But there’s a problem; as a result of his own naiveté and confusion, the Giant is actually haunting P.T. Barnum’s fake. The humbug had been humbugged. Once interest in the Giant waned, a newspaper editor in Iowa purchased the fraudulent fossil. He kept it as a conversation piece in his basement where it was photographed for a 1939 National Geographic spread on the Hawkeye State. Soon thereafter the Giant was returned to, if not the scene of the crime, at least nearby, where he now rests in peace, finally, at the Farmers’ Museum in Cooperstown, New York. Ken Feder is a professor, archaeologist, and author at Central Connecticut State University. He devotes a chapter to the Cardiff Giant in his book Frauds, Myths, and Mysteries: Science and Pseudoscience in Archaeology (9th edition, Oxford University Press). His latest work is Ancient America: Fifty Archaeological Sites to See for Yourself (Rowman and Littlefield). It not just a travel guide; it’s a time-travel guide. This essay is also part of a Zócalo Inquiry, Why We Need Monsters. Primary Editor: Sophia Kercher. Secondary Editor: Lisa Margonelli. *Photos in the public domain.